Casa Camille is a grand, elegant and exclusive 4 bedroom Premier Villa in Vale do Lobo II, part of the central Algarve, Portugal. With stunning sea views and within short walking distance to the beach, this villa is the ideal holiday destination. If you are looking for a villa with a 'wow' factor, this is it, in every aspect. A dream holiday destination for any age group, not only due to its location but also the villa itself. Set on a high slope the views are fantastic. Inside, the beautiful hallway opens to the living room with fireplace, dining/sitting room plus a fully fitted kitchen. Access to a large terrace and gardens. On this floor are two twin bedrooms with shared bathroom and a kitchenette/dining area. On the first floor is the master bedroom with dressing room, en-suite bathroom, separate toilet and private terrace plus another bedroom with en-suite. In the basement is a mini-gym and a tennis table.There is also a guest toilet, sauna, steam room and double garage. The large gardens feature open and covered terraces, a beautiful pool, a children's play area and a putting area. Vale do Lobo II is situated next to Dunas Douradas. The lovely long and sandy beach is only a short walking distance away. 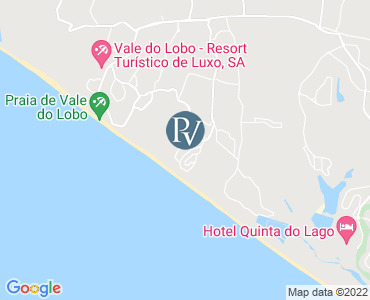 The restaurants at Julias beach and Vale de Lobo are within 10-15 minutes walk along the beach. And for the golfers: Some of the worlds best golf courses are only a short driving distance away: Vale do Lobo Royal and Ocean, Quinta do Lago South and North, Laranjal, Sao Lourenco to name just a few. All ground floor bedrooms have doors onto the terrace area. Change of towels 2 x week, change of linen after 7 days occcupation. Pool towels, where provided, will not be replaced during stay. Extra cleaning possible on request for €14,50 per hour. Possibility of hiring pool towels at €5 per week per towel. Thank you for your help in organising our recent holiday in Portugal. Casa Camille was stunning and the service both from the UK and through your team over there was excellent. We would certainly recommend Premier Villas to friends and hope to be back in touch next year! All prices are per week for the villa only. Villas are booked from 16.00pm on your arrival day to 10:00am on your departure day . Please note that availability shown is subject to confirmation - please call our reservations team.